Born Andrée Auclère on February 20, 1926 in Paris, France, the daughter of a baker, Maryse Begary (1926-2007) was one of the most accomplished and celebrated aerialists of her day, famous for her exceptional handstand on the trapeze bar—which she could hold for more than one minute—and her spectacular series of rotating one-arm planches (also known as "dislocations"), with which she emulated her idol, Lillian Leitzel (1892-1921). Young Andrée started training on the trapeze on her doctor’s recommendation, to improve a poor health condition. She became apprentice to a celebrated gymnast on horizontal bars, Nicolas Marcoud, who had a successful career with the Marcoud-Banola Troupe. Andrée adopted his name (as was the tradition then, in the circus, when a young performer had apprenticed to a famous master) when she started her performing career. Thus, under the name of Andrée Marcoud, she made her professional debut at Paris’s Cirque Medrano on April 14, 1939; she was thirteen years old. Andrée Marcoud quickly made a name for herself: Her handstand on her trapeze bar didn’t fail to impress circus professionals and aficionados, and her act continued to improve over the years. After the German occupation of France during World War II, Andrée was featured in 1946 (and again in 1950) at Paris’s (and the world's) oldest permanent circus, the Cirque d’Hiver. The following year, she went on tour with the French Cirque Figuier under her real name, Andrée Auclère: Raymonde Marcoud, Nicolas Marcoud’s niece, was also performing at that time, and Andrée didn’t want to create any confusion. That same year, 1947, Andrée married Franz Begary, a former pilot in the French Air Force who had just left the military. Andrée Marcoud-Auclère finally became Andrée Begary, and changed her first name for the more romantic Maryse. It is under that name, Maryse Begary, that she continued her career—thus confusing a few circus chroniclers and historians: Andrée Marcoud and Maryse Begary are sometimes mentioned as "the two only aerialists" who, after the creator of the trickAny specific exercise in a circus act., Miss Fillis (Nicolas Marcoud's daughter), were able to hold a handstand on their trapeze bar! Franz Begary became Maryse’s assistant and manager, a marital partnership that would last until Maryse’s death. The amazing Maryse Begary was much in demand in France and Europe. 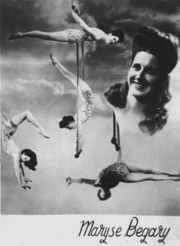 In the winter 1949-1950, she was featured at Bertram Mill’s Circus at London’s Olympia, where she shared the bill with another legendary aerialistAny acrobat working above the ring on an aerial equipment such as trapeze, Roman Rings, Spanish web, etc., Alma Piaïa. The next winter, she appeared at Circus Carré in Amsterdam, then under the management of the Strassburger family; she was twice featured at Glasgow’s Kelvin Hall in Scotland, and performed at Blackpool’s Tower Circus in England, Cirkus Schumann in Copenhagen, and Circo Americano-Castilla in Spain, among many other prestigious European venues. In 1955, Maryse doubled Gina Lollobrigida for the aerial sequences of Carol Reed’s movie Trapeze (1956), shot at Paris’s Cirque d’Hiver; she would later double Rita Hayworth (and Claudia Cardinale) in Henry Hathaway’s Circus World (1964), co-starring John Wayne, and shot at Circus Franz Althoff—a movie that has kept on film several great circus acts of the period. Maryse would eventually settle in Sarasota, Florida, home of a great number of circus performers, but she returned to Europe at the end of her first American engagement to join the company of Le Cirque Français, a French circus troupe that was heading for Leningrad and Moscow—the first circus from the Western World to appear in the Soviet Union. In the winter 1960-1961, Maryse Begary performed with great success at the old Circus on the Fontanka in Leningrad (today St. Petersburg), and at the Circus on Tsvetnoy Boulevard in Moscow. Back in the United States, Maryse Begary performed with Clyde Beatty-Col Bros. Circus, Hanneford Circus, and Polack Bros. Circus, among many other venues. She also appeared on television on CBS's The Ed Sullivan Show, aired on October 14, 1962, and over the years, on several TV shows in Europe and America. She made her last appearance in Europe in the summer of 1966, at Blackpool’s Tower Circus. Maryse Begary’s long and stellar career ended in 1986, when she reached the age of sixty—quite an old age for an aerialistAny acrobat working above the ring on an aerial equipment such as trapeze, Roman Rings, Spanish web, etc.! She retired in Evansville, Indiana, where she lived with her husband in her old circus trailer, and where, sadly, she died of a belatedly detected cancer on October 2, 2007, at age eighty-one. She left the memory of one of the great trapeze artists of the twentieth century.